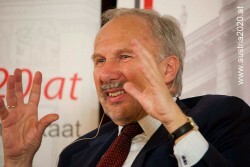 Ewald Nowotny, the head of the Austrian Central Bank (OeNB) as well as the Minister of Finance, Maria Fekter, appreciate the announcement of Erste Group. Yesterday, the bank published to expect losses of € 800m for 2011. Only two weeks ago, the bank said to estimate profits of € 800m. In meantime, Erste Group decided to write off several substantial risks. Especially the subsidiaries in Hungary and Romania caused high risk provisions. This article includes a total of 212 words.